Propagation is the process of breeding plants by using leaves, cuttings, pups or offsets. Luckily for us, succulents are extremely easy to propagate with little effort required, but lots of patience necessary. Theres nothing quite like watching your propagating plants grow from a single leaf into a whole new plant. Here is how its done! Gather together a few different succulent leaves. The trick here is to take a few leaves from a variety of different succulents as it is not guaranteed that all of your leaves will produce a new plant. The more the merrier! TIP: When taking leaves from the stem it is important not to break the leaf off but to peel it or twist it from the base of the leaf as this is where the roots will grow and the new plant will form (in most cases). Take your shallow tray and lay 1-2 inches of soil down. This is where your leaves will spend the next few weeks to months. Lay your leaves just on top of the soil, there is no need to bury them. Place your tray in a position where it receives indirect sunlight and bright light but NO direct sunlight as this will burn the leaves. This could mean in a window sill or outside under a verandah. Let the leaves sit on the dry soil for 2-3 days to allow the base of the leaf to callous (preventing root rot) before misting with water every 1-2 days. Be patient! Depending on the type of succulents you are propagating, roots can be seen anywhere from days to months after setting up your tray. Continue to mist your leaves to keep them moist and eventually you will begin to see pink or white roots at the base of the leaf or in some cases a new plant will begin to form before any roots are made. TIP: The mother leaf is where the new plant receives most of its nutrients, it is beneficial to leave this leaf attached for as long as possible, it will eventually shrivel up or fall off on its own. Appreciate your new plant and watch it grow! 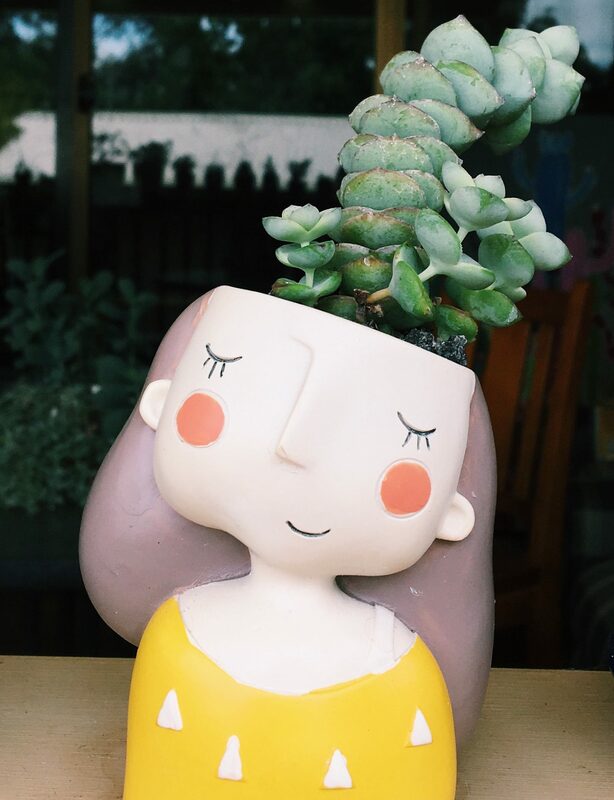 Your new addition/s can be left in pots where they are able to grow and develop or they can be used for projects when they have reached their desired growth according to you! Great post – loving the new babies! Thank you for that advise. I will try it out with my succulents. One of my favorite activities!